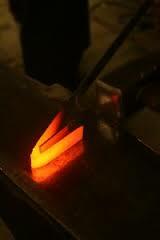 Welding is forging together at a temperature at which the steel attaches to each other. There are skills required to get reliable connections. The material must be heated between 1,000⁰ and 1,200⁰ degrees C. Is it too cold then no connection between the parts is created. Is it too hot then the carbon present in the sample burns and can cause cracks. Between the mating surfaces to be joined is flux (silver sand or borax) applied. This melts and forms a layer of glass which interfering oxides on the metal surface stop and repel oxygen. Thus, oxidation is prevented during the processing. You can also make slats of forged together layers of hard and soft materials (steel and iron species). Due to repeatedly welding and double pleats you get laminate with e.g. 7 layers. The material is tough and resilient. 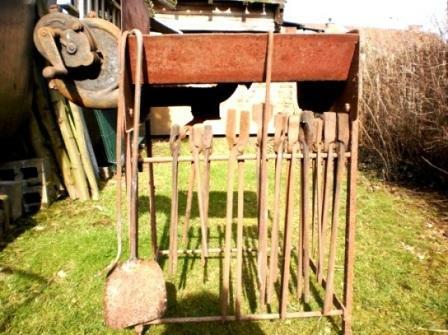 From then, when one could carburize, iron was suitable for weapons and tools. There are Gallic wheel bars found with 5 layers. The earliest swords had around 7 to 9 layers, always odd, the steel in the middle. This Damascus steel is recognizable by the patterns of banding that are as unique as tree rings and structures in wood. Various types of steel can even already be in the base product, e.g. bicycle chain, chain saw, steel cable. More and other drawings and patterns you get through torsion, combining (twisted) parts, etc.